The Football season is a long one, and despite the wear and tear of a physical sport, some players have something click to make them better in the second half of the season. This can happen for a number of reasons, from a rookie finally getting used to the speed of the game, a veteran recovering from a nagging injury, or a player getting deployed differently to more success. Here are 10 players from across the NFL that drastically improved in the second half of the season. After struggling with poor decision-making in the first half of the year, Darnold suffered a foot sprain that put him on the sideline for a month. However, when he returned in Week 14, he was a different player. From Week 14 on, Darnold completed 125 of his 140 passes for 931 yards, six touchdowns and one interception. He produced eight big-time throws and just two turnover-worthy passes and, most impressively, he produced a 118.5 passer rating from a clean pocket – 35.4 points higher than his mark over the first half of the season. 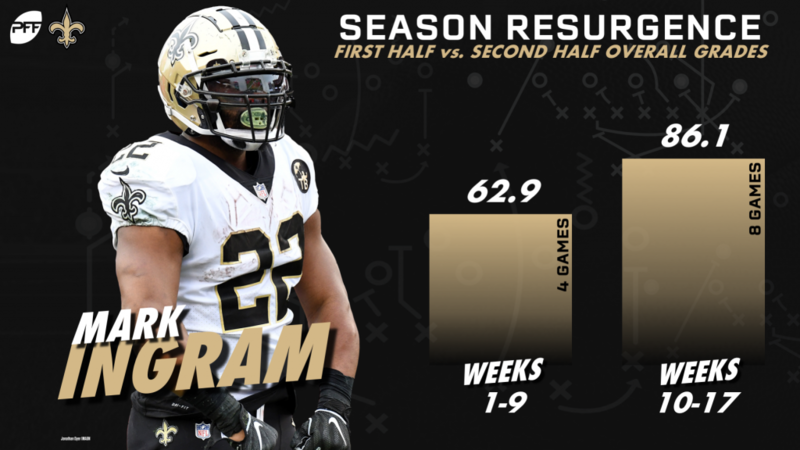 Mark Ingram had a stellar second half of the season, finishing with the second-best overall grade among running backs in the final eight games. Perhaps due to the extra rest that he received courtesy of a four-game suspension, Ingram got better as the season went along. He averaged 0.19 missed tackles per touch over the second half of the season, compared to 0.12 in the first half. Most importantly, he started making big plays again. After he failed to record a single breakaway run (runs of 15-plus yards) in his first four games, he broke off seven such runs the rest of the way. A poor 2017 season and a mediocre start to 2018 had some people wondering if we’d ever see another dominant season from Amari Cooper, but a trade away from Oakland changed things for the former first-rounder. Plagued by inconsistent targets in Oakland, Cooper was finally able to get into a groove in Dallas and averaged over eight targets per game. He improved his yards per route run average from 1.39 to 2.22 and his passer rating when targeted from 94.0 to 127.5. Engram caught only 35-of-54 targets (68.0%) for 338 yards and averaged just 0.84 yards per route run through . the first nine weeks of the 2018 season. The second half of the season was a different story, though, and it’s that performance that should give Giants fans hope for the future. From Weeks 10 to 17, Engram caught 28 of his 38 targets (73.7%) for 432 yards, averaging of 3.04 yards per route run in the process – the second-best rate among tight ends in that span. 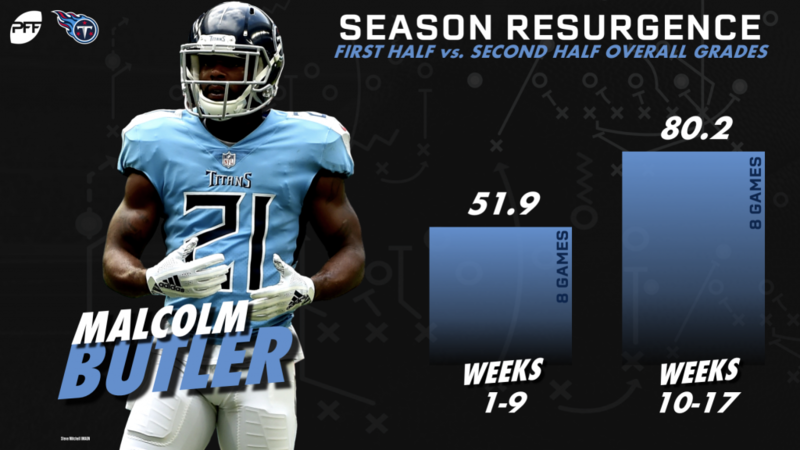 His second-half performance has a lot to do with his work after the catch, as he averaged a colossal 10.0 yards after the catch per reception in the season’s last eight weeks, compared to only 6.5 yards after the catch per reception over the first nine. Like Engram, part of Njoku’s second-half resurgence comes from getting more opportunities to do damage after the catch. He averaged 4.0 yards after the catch per reception in the first half, but he managed to raise that to 7.7 in the second half. He also managed to sure up his hands over the last stretch of games, recording only one drop in the final eight games compared to his seven drops in his first nine games. 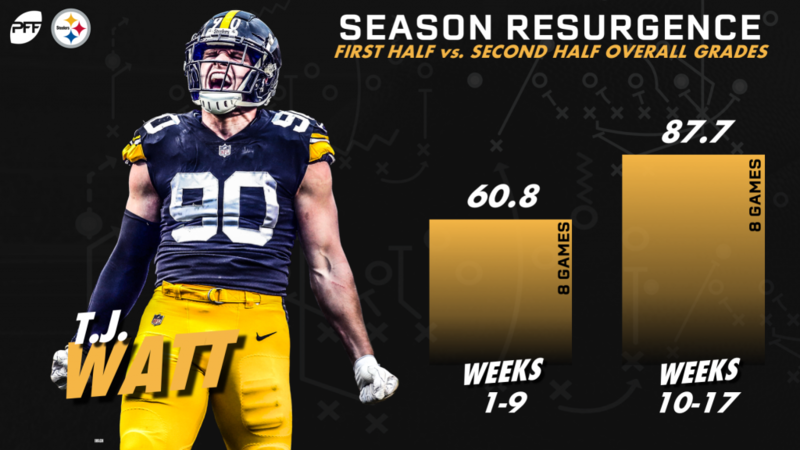 Watt is another example of a player who hit his stride in the second half of the season rather than hitting the wall. While his first-half box score numbers were impressive at first glance (his 27 quarterback pressures ranked fifth among edge defenders from the AFC North), what the box score doesn’t show you was the fact that 12 of those pressures were either charted as cleanup or pursuit pressures. In other words, Watt was a beneficiary of his defensive scheme rather than winning his pass-rushing matchups outright. That changed over the last half of the season though, as Watt produced 25 pressures over the last eight games, with only four of them coming via scheme. Watt raised his pass-rush win percentage from 12.8% in the first half to 20.7% in the second half and recorded a pass-rushing grade of 90.0 from Weeks 10 to 17 that was second only to Von Miller in that span. After he sustained a calf injury in training camp, Vea started slowly as a rotational player and struggled both against the run and rushing the passer, managing only five pressures in his first five games. However, his playing time and production really started to pick up once he was placed in the starting lineup for Week 12. From then on, Vea’s 19 total pressures led all first-year interior linemen, and his 16 defensive stops ranked second. Evans turned it on late in the season for Tennessee, earning three single-game grades above 83.0 in the final five-game stretch. He also thrived against the run for most of his 2018 campaign, as he finished the year with an impressive 72.5 run-defense grade after a rocky start to the season. To put it mildly, things did not go well for Malcolm Butler in the first half of the season. He registered a shockingly low coverage grade of 53.4 and allowed over 100 yards receiving three times in Weeks 1-9. Fortunately for Tennessee, Butler reminded them exactly why they coveted him in free agency by finishing the season with an 83.1 coverage grade over their final eight games. His passer rating allowed fell from an astronomical 141.8 in the first half of the season to just 40.4 in the second half, and his 2.31 yards allowed per coverage snap fell to 0.66. Marcus Peters had a rough start to his first season with the Los Angeles Rams. Through the first nine weeks of the season, he allowed the second-most receiving yards (591), the second-most touchdown receptions (six), the fifth-highest passer rating on throws into his overage (145.2) and earned the fourth-worst coverage grade (39.9) among cornerbacks in that span. However, the last seven weeks were another story, as he earned the eighth-highest coverage grade among cornerbacks (80.1) in Weeks 10-17. He also allowed the seventh-lowest passer rating on throws into his primary coverage (52.9) in said span.